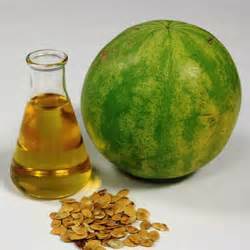 Kalahari Melonseed oil is a triglyceride oil, cold pressed from the seeds of Citrullus lanatus of the Cucurbitaceae family that originate from the Kalahari region in southern Africa. The oil is filtered and has a pale yellow colour. It is light and quickly penetrates the skin. Analysis of the oil shows that linoleic acid is present in the highest concentration, followed by oleic, palmitic and stearic acid. Kalahari melon oil contains a high level of y-tocopherol (70.56 mg/100g), followed by a-tocopherol (25.94 mg/100g), which provide anti-oxidant properties as well as a reasonably good shelf life. Kalahari melon oil is high in anti-oxidants and is used in the cosmetic industry for the manufacture of moisturising and rejuvenating skincare products. Kalahari Melon oil is used in massage oils and body creams and has soothing characteristics. In Central America and India the oil is applied to lesions, sores and ulcers. Traditionally it has been used medicinally as a diuretic, for treating urinary diseases and fever. Store in a cool dark place in a closed container with minimal headspace.